At the moment, Duke is an overwhelming public favorite to not only reach the Final Four but win the national championship. More than 40 percent of the early entires in <strong>CBS Bracket Games</strong> have the Blue Devils winning it all, so it might be time to pump the brakes, or at least offer up some contrarian suggestions to this majority opinion. First, it's a single-elimination basketball tournament. We love the NCAA Tournament and March Madness because the single-elimination format does not set up for the better team to win like a best-of-seven series is formatted. Duke is the No. 1 overall seed because, when full strength, it is the best team in the college basketball. But even at full strength, this team can be defeated. The Blue Devils lost to Gonzaga in the Maui Invitational, and then while not at full strength, Zion Williamson and R.J. Barrett were in the lineup and healthy for a home loss to Syracuse -- though Tre Jones was knocked out of the game with an injury and Cam Reddish sat out due to illness. 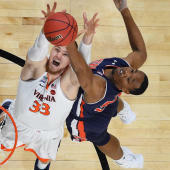 That same Syracuse team pushed Duke much more than anyone discussed in Zion's ACC Tournament, blinded by the excitement of the country's best player going 13 of 13 from the field after missing nearly a month with a knee injury, and both Florida State and North Carolina were tough obstacles for the Blue Devils to overcome in its path to an ACC Tournament championship. So now we turn our attention to Duke's NCAA Tournament path and what lies ahead between the first round and Final Four. Below, we've ranked the most likely obstacles in terms of threat, starting with a team that already has experience taking down the Blue Devils. Too many factors point to Virginia Tech having all the tools to bust millions of brackets in Washington D.C. on Friday night, and now we just wait to see if the Hokies can both get there and pull off the upset. It would be an upset according to seeding and the likely Las Vegas betting line, but one of the real keys to Virginia Tech being the biggest threat to Duke in the region is that it wouldn't feel very much like an "upset" inside the Hokies locker room. Virginia Tech has defeated Duke in back-to-back seasons in Cassell Coliseum in Blacksburg, with star guard Nickeil Alexander-Walker and big man Kerry Blackshear playing major roles in both wins. This year's loss for Duke was without Williamson in the lineup but the Hokies were also without senior guard Justin Robinson. The former is more impactful than the latter, since Williamson is likely the National Player of the Year, but I think Robinson's absence is significant enough to note and his return gives enough of a boost to the Hokies to think they can take down Duke again. How about this for storylines? The ACC Network is producing a documentary later this year that will review the early years of Mike Krzyzewski's Duke career, focusing on how Johnny Dawkins, Jay Bilas and a class of players elevated the status of the program and saved Coach K's job when he was on the hot seat. Beyond the coaching connection in this potential matchup between Krzyzewski and Dawkins -- who was also a Duke assistant -- is the athletic director family reunion we'll have in Columbia, with Duke athletic director Kevin White and his son, UCF athletic directory Danny White. However, on the court is where UCF could cause some real problems and give Duke its second first-weekend exit from the tournament -- the last also coming in the Second Round in a South Carolina-based pod -- in the last three years. At 7-foot-6, Tacko Fall is the most imposing rim protector in college basketball. Duke, as many have noted, relies heavily on making plays at the rim with Barrett and Williamson to get its offense. If Fall shuts things down inside, Duke's 3-point options might be limited due to a 30.2 3-point shooting percentage that ranks No. 338 of the 353 Division I teams. Then, the role of CJ McCollum could easily be played by UCF star guard B.J. Taylor, a senior who has helped Dawkins guide this resurgence in Orlando and would love nothing more than to finish his career with an iconic March Madness performance. I realize this is probably unfair to Cassius Winston, Nick Ward and a Michigan State team that has overcome multiple injuries and setbacks to win not only the Big Ten regular season title but also the conference tournament title, and in doing so, swept rival Michigan. That's a 1-seed resume, and by many accounts, the Spartans could have received and possibly deserved a spot on the top line. In a power ranking world, Michigan State appears to be the biggest threat to Duke. But I can't ignore one glaring statistic: Mike Krzyzewski is 11-1 against Tom Izzo. Considering we're talking about two Hall of Fame coaches, the fact that the matchup is so one-sided seems like an anomaly. Coach K vs. Izzo doesn't need to be like flipping a coin, but 11-1 isn't even the kind of results you get rolling with a loaded die. This year's Michigan State team could turn the tables on that narrative (Izzo does have a fantastic record in games on a two-day turnaround, like he would have to prepare for Duke in the Elite Eight), but until I see it, it's still not going to be the biggest threat to the Blue Devils because I'm picking Coach K every time. Of the many potential head-to-head matchups in the East Region between players, few are more enticing than if we get to see Zion battle down low against LSU big man Naz Reid. Both players bring not only size, athleticism and versatility that have been matchup problems for opponents, but both players also are likely going to be pros in the very near future. The point guard battle between Jones and Tremont Waters is also among the best potential backcourt showdowns we can get, as Jones would be tasked with slowing the spark plug for LSU's offense. This game does look more threatening to Duke if Will Wade is on the sideline and the basketball program is not in the midst of fallout from FBI-related news reports, but as it stands, Wade is not with the team and therefore cannot be factored into the decision-making process. But note this: with or without Will Wade, if LSU is able to keep this thing together long enough to win three games and make the Elite Eight, it's got the personnel to run side-by-side with Duke in what might be the most entertaining potential matchup in the East Region. After 2018, we have to ride a "never say never" approach with the 1-16 games, even with the No. 1 overall seed. North Carolina Central coach LeVelle Moton made headlines with his jokes about a potential matchup against their fellow Durham, N.C. residents, noting that he wanted no part of Williamson. He's since clarified the comments, taken somewhat out of context, though you can't tell me that no one in the selection committee room offered a laugh or two at the irony of seeing the bracket following Moton's post-MEAC title declaration.